Winnipeg – Voting packages are now being mailed to farmers eligible to vote in a producer plebiscite on the future of the CWB. The Prairie-wide plebiscite asks farmers if they want to sell wheat and barley through the CWB’s single desk, or through an open market. “Wheat and barley farmers can expect to receive their voter packages by July 22,” says plebiscite coordinator Ian Craven of MNP, a chartered accounting and business advisory firm. Voting packages are being mailed to more than 68,000 farmers who had an active permit in either the 2009-10 or 2010-11 crop years and who delivered wheat or barley in the past five crop years (2006-07 to 2010-11). Farmers have until Aug. 8 to establish their eligibility to vote. – Producers who have grown wheat in the past five crop years are eligible to vote on the future of the CWB for wheat. – Producers who have grown barley in the past five crop years are eligible to vote on the future of the CWB for barley. – Producers who have grown both in the past five crop years are eligible to vote on the future of the CWB for each crop. Return ballots must be postmarked by August 24. Winnipeg – Allen Oberg, chair of the CWB’s farmer-controlled board of directors, today issued the following statement about the results of yesterday’s federal election: “We congratulate Prime Minister Stephen Harper and look forward to working constructively with the federal government in the best interests of the farmers of Western Canada. “The same important democratic principles that determined yesterday’s federal election also apply to farmers’ decisions on grain marketing. Prairie producers have been clear that they should determine the future of the CWB as their marketing organization. Through a sound democratic election process, they have chosen their representatives on the CWB’s board of directors since 1998. “Farmers have the right to continue to make the decisions themselves about the role and structure of their marketing approach. The path forward must be forged in clear accordance with their wishes. “This issue is crucial to farmers’ livelihoods, to the economic stability and competitive viability of Canadian wheat and barley exports, and to the spirit of democracy.” Allen Oberg is a grain and cattle farmer from Forestburg, Alberta, who was elected by his fellow producers to the CWB’s governing board of directors. The board of directors is comprised of 10 farmer-elected directors from across Western Canada, and five federal government appointees. The board sets the CWB’s policy and direction, with the overriding goal of maximizing farmer returns from the sale of their wheat and barley. Controlled by western Canadian farmers, the CWB is the largest wheat and barley marketer in the world. One of Canada’s biggest exporters, the Winnipeg-based organization sells grain to more than 70 countries and returns all revenue, less marketing costs, to farmers. Every year the international accounting firm of Deloitte and Touché issue their audited statement on the Canadian Wheat Board. One of the measures they use is called “net despatch.” It is a test of how efficiently the CWB, the grain terminals, and the railways are at getting grain to port and into the ships. When the CWB asks a ship to take on a cargo, they book the ship for so many days. If the ship stays overtime, the CWB and therefore farmers, pay the ship for the extra time it spends in port. This is called demurrage. On the other hand, if the ship gets out of port early, then the ship owner pays what is called despatch back to the CWB and ultimately farmers. For a while the railways were reluctant to run trains through the Rockies in the winter. Perhaps they did not like the snow on their engines. This was costing farmers demurrage. So the CWB sued the two railways for poor service and won over $30 million dollars for farmers. Now the railways seem more than eager to get the grain to port on time. A ship’s loading window is always going to be a balance between the interests of the ship owner and the shipper (in this case the CWB). Time is money for both parties. However it would be foolish for the CWB to make unrealistic commitments on loading time and repeatedly incur demurrage by not being able to deliver. On the other hand, the ship-owner is not going to agree to an unrealistically long timeframe that keeps the vessel at a standstill and makes it certain that he will be paying despatch to the CWB. The CWB also has an interest in maximizing port capacity particularly at Vancouver and this is achieved by booking in as many ships as possible with a realistic loading time for each one. The measure of how good the CWB is at all this is called “net despatch.” Last year Deloitte and Touché reported there is $7.4 million dollars in the CWB’s accounts because the ships got loaded ahead of time. They call it “net despatch.” A very nice amount that means the pool accounts are just that little bit larger. Offshore feed-barley values remain high for western Canadian farmers. The CWB’s latest PRO lists an estimated value of $4.94 a bushel (in-store) for Pool A feed barley – an indication of recent prices available from overseas buyers. In Alberta farmgate terms, that’s $3.61 per bushel – about 50 cents above the going domestic feedlot rate. The CWB has been actively working to take maximum advantage of this window of relatively high international prices. Our barley marketers have now sold well over half a million tonnes through both cash sales and the pool, constrained only by rail and West Coast logistics that limit the volume exportable in a short period. Yet the naysayers have still been taking pot shots at the CWB’s role in feed barley marketing. I would like to reassure farmers that the CWB returns to them all the profit margin from these sales, whether conducted through cash buys or the pool. All that is deducted are costs – which include the costs of prudent risk management. References to the situation in 2008 have conveniently failed to note that the private trade bought about 800 000 tonnes of feed barley in anticipation of a government move to introduce an open market for barley. After the court ruling that deemed the government’s process illegal, the CWB took over the execution of those sales to the end buyers and also sold several hundred thousand tonnes purchased directly from the trade, which had purchased it directly from farmers. It would have been extremely difficult to determine which farmers contributed to those cash sales and at what prices, which is why the margins were directed to the CWB’s contingency fund, set up to facilitate the operations of Producer Payment Options and cash buys, which take place outside the pools. But what’s most troubling is the misleading implication that, under current conditions of rising offshore prices and high volatility, farmers would somehow be better off in an open market. The reality – of course – is that grain companies would have no incentive to pay farmers more than necessary to source this grain. They would (naturally) buy feed barley at prices just above the domestic value, sell it at the higher international values, and retain the profit margin. This crucial point is being ignored. Instead, farmers are being dragged into a politically motivated debate that essentially boils down to whether the CWB is too conservative in its approach to risk management. However, our approach – approved by our farmer-controlled board of directors – is based solidly on a commitment to carefully manage producers’ money and maximize their overall returns. We heard this before in the 1990’s, when other anti-Board types made the same claim Mr. De Pape is doing now. R-Calf the U.S. protectionist group was listening. What they heard then was the CWB was providing subsidized grain to Canadian feedlots. They successfully got the U.S. Department of Commerce to launch a trade challenge against Canadian feedlots and the CWB on the basis of what the anti-Board types like Mr. De Pape had been saying. The Yanks audited six representative Canadian feedlots, all CWB barley sales, and private trade sales in both Canada and the US. Fighting the challenge cost over $10 million dollars. 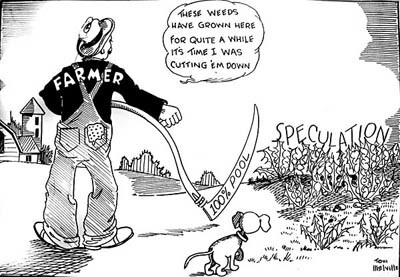 The Yanks found the CWB was actually getting higher prices for barley than the open market was providing and also concluded Canadian feedlots were therefore not subsidized by the CWB. As a private trader Mr. De Pape certainly has a right to his opinion, but the U.S. Department of Commerce investigation into barley and feedlots in Canada shows he is not on solid ground about the CWB and domestic barley prices. I hope his opinion does not cost another $10 million. A private broker has suggested that something like the Canola Council of Canada be given the difficult task of answering international trade challenges on behalf of farmers. He concludes we really do not need a CWB single desk. What the one has to do with the other is only known to him. Now let’s deal with this nonsense about having a Canola Council style group respond to trade complaints. 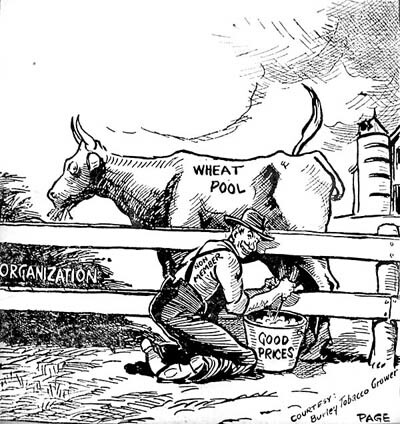 In 1998, after over a year of trials, audits, and investigations by the U.S. Department of Commerce, the Canadian Wheat Board successfully established that it did not subsidize feed grain for Canadian feedlots. The cost? A little over $10 million, or more than two years of Canola Council research budgets.